Drain your waterbed FAST & EASY! Vinyl Repair Kit is always good to have handy! 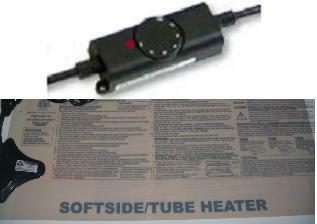 It is the best waterbed heater because its very reliable and that is why its our best seller. It works with king, Queen, Full or Twin Size waterbeds. It also works with softsided mattresses that have tubes. Element Insulation: Double insulated, with an outer sheath of water tight, Polyester tested to UL 1445 by independent test authority. Power Cord : Integrally moulded. Watertight. Tested for tensile strength. Over Heat Protection: Automatic protector incorporated in the element. Temperature control: Electronic thermostat with Thermistor transducer. Enclosure Material: Fire resistant plastic. Temperature variation at PVC mattress: Electronic thermostat ± 1ºF at normal comfort room temperature.